Truth in advertising wasn't an issue in the past. 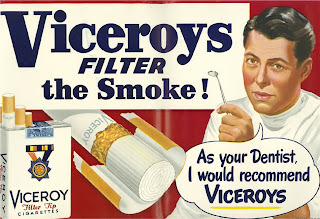 The Stanford School of Medicine has put together an exhibit of tobacco advertisements over the past 100 years. Aside from the occasional billboard, cigarette ads don't much of a place in American culture any more. I remember seeing the Marlboro Man on TV when I was a kid, but then tobacco ads were pulled from TV. Even NASCAR has gone the same way....the Winston Cup doesn't exist anymore. Our Surgeon General Warnings on ads and packaging are small compared to the warnings on packages in Canada and Europe (think "Smoking Kills" in 100 point font). Does your dentist recommend cigarettes? Maybe not, but his grandfather did. Click here to check it out.